Hey everyone! I'm so excited about this interview today. People always ask me about side hustles that are easy to get started with, and I honestly believe that going to local garage sales, buying random stuff, and turning around and selling for a profit is one of the most accessible arbitrages out there. 1.) What prompted you to flip stuff in the first place? My wife and I have quite a bit of student loan debt, and we chose to pay it down as fast as we could. That decision left us with enough money to be happy and have what we needed, but with a baby on the way, I wanted some other options. 2.) What is the most difficult part of flipping used things? I’ll start with the easiest part: finding stuff! Anybody with an Android phone, or even one of the more self-centered smartphones, can go to garage sales and estate sales if they are willing to wake up early on weekends and plan a little bit. This isn’t a tutorial… but really all you need is the eBay App to check “Sold Listings” for an idea what items sell for. 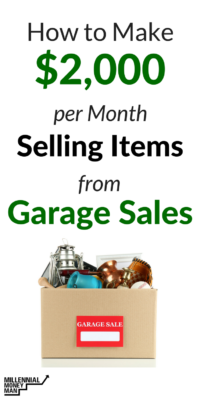 You can go to garage sales with as little as $20 – $50 and just look for stuff you like or know a little about. Be sure to filter the eBay app by “Sold Listings” to get the best idea what similar items are selling for. At the very first estate sale I went to, I found a drum set for $60, cleaned it up and researched all the parts online, and it sold for $480 on Craigslist! Listing locally on Craigslist, Facebook Martketplace, OfferUp, LetGo, etc is super easy. Ebay has a learning curve and fees, but it comes with a HUGE audience. The most difficult part at the beginning for me was learning how to make quality listings on eBay and figuring out shipping. Some items just won’t sell well locally but may sell great on eBay. For example, a Sony surround sound receiver and a VCR-to-DVD recorder I paid $5 each for wouldn’t sell locally, but on eBay they both sold for over $170 each. Well worth watching Youtube to learn how to list, pack and ship them! Another challenge was taking good photographs. I would always see items similar to mine with better pictures, and that drove me nuts! It’s all about the lighting, so please don’t think you need to have a nice camera. Your smartphone or digital camera will take great photos with the right lighting. I spent some time watching YouTube to improve my lighting skills, and it really paid off. My home has bad natural light, so I eventually bought a $130 lighting setup, because I got tired of moving lamps around and crawling on the floor to chase the best daylight. Well, actually… I got tired of waiting for my wife to leave so I could completely and secretly rearrange the kitchen furniture to capture the best light and use our blankets for a backdrop! So, the lighting investment helps a lot, especially if you can only take photos at night, but it is certainly not needed to start. 3.) What is your time commitment like? I can spend as much time as I want. As a band teacher, sometimes I have none, but sometimes I have a lot, like on holidays. I usually spend well under 10 hours during a typical week. During the summer, I could hit 20 garage sales before noon on a Saturday. I am signed up for the garage sale listings in my town to be emailed to me. I paste the addresses into EasyMapMaker.com, and that gives me a big map of all the sales, and I can plan my route in about 15 minutes. I live deep in the suburbs of a big city. Your location might be different and have it’s unique upsides and downsides, but it’s worth figuring out what those are. The largest amount of time for me goes into cleaning, researching and listing the items. Facebook Marketplace, Craigslist, and the mobile apps like OfferUp and LetGo are super easy to list on. Ebay requires you to know “stuff”, but every question or problem you might run into is covered on YouTube for free! 4.) What made you land on shoes of all things? I would see TONS of used and new shoes while at garage and estate sales, but I didn’t know much about them, so I always passed on them. I decided to learn more, so I researched reselling shoes online. Then, one glorious day, I picked up a pair of shoes for $2 at a garage sale that I sold on eBay for $649. That was a turning point for me! Do you know anybody that wears shoes? Do you know anybody that has more than one pair of shoes? They are easy to find at thrift shops and virtually impossible to damage during shipping, unlike the antiques and electronics I’ve sold. USPS Priority Mail Shoe Mailers are FREE, and it is really easy to pack and ship shoes, versus, say, a stereo receiver. That $649 sale was eye-opening. It’s crazy to me that someone would pay that much for a pair of lightly used shoes, but it’s even crazier that the retail price of those shoes is around $2000. The buyer actually got a bargain and was super happy with them!!! 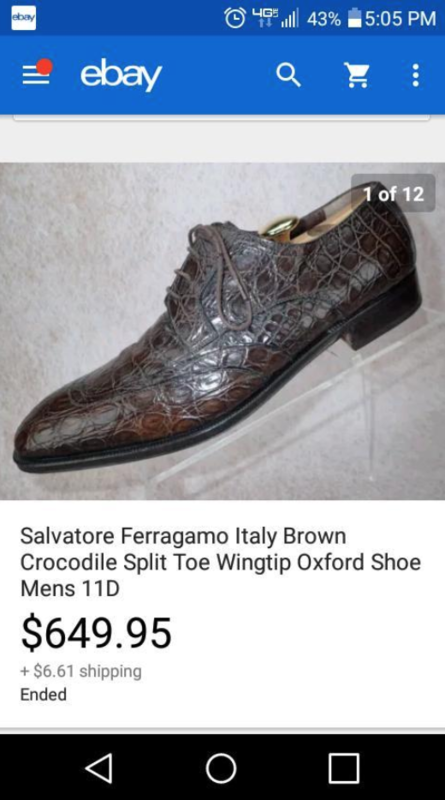 The $649 shoe is a unique find, but finding used shoes at the big thrift stores that sell online for $40 – $150 is actually quite common! 5.) How much of your profit are you reinvesting into your business (or alternatively, what are you putting your profits towards)? I put most all of it back into inventory growth and supplies. My short-term goal is to soften the fast-approaching blow of childcare for our new baby boy (born Dec. 10) or any potential pay cut that might happen in the future. I need a new computer and cell phone soon, and it feels great knowing that my wife won’t have to cut our student loan payments. I gives me great peace just knowing that I can make an extra $2 – $3k a month on the side. If I lost my job, I know we could survive just with what I’ve learned on this little side hustle journey. 6.) What is the most unexpected thing about this side hustle? Selling shoes has been the most unexpected part for sure. I like it so much! I get more excited every day and can’t wait to source items and get them listed. Sourcing feels like treasure hunting. When I come home from work or have a spare moment, I can’t wait to knock out some photos or listings. I do miss garage and estate sales, but my job limits my weekends a lot. 7.) Do you have long-term goals for this gig? I am not sure, but I do want to continue reselling. I have run into so many nice people willing to share their knowledge and experience online, nearly all for free. The reselling community is very much like the Millennial Money Man community here. There are so many REALLY smart people ready to help you. The time we are living in right now is definitely something to be grateful for! If you have been thinking about taking action to make some extra money, just start! Have you ever tried to flip items? Did it work? Selling shoes you bought for $2 and making a 32,397% profit on them…I tip my cap to you sir!! Thanks! Now, if I could figure how to hit that home run every week, Id be set!! Haha yeah that was freaking killer! Love this article! Can’t wait for warmer weather/garage season to get here! I did a lot of retail arbitrage using Amazon FBA to pay for our 2016 wedding in cash. My favorite “flip” was a Trump book I bought for $5 at an antique store and sold for $169 on Amazon (not to get political or anything, I just happened to be able to cash in on all the election hype I think). I agree with the analogy that it’s like a treasure hunt! I would love to learn more about/join the reselling FB community you mentioned…any chance you can share the group? I’ve done some flipping of items. It’s actually a side hustle I am looking into expanding. The space constraints and slow turn around time have made it difficult for me to scale. I am looking to implement systems in order to streamline the processes. Space constraints for sure! My wife doesn’t like clutter, so I got super lucky to find a clean, climate controlled 10X20 24hr access storage unit a quarter mile from my house for $150 a month, below the norm in my area. It’s been well worth it for us and while I hate paying for it, it allows me to buy whatever and not worry about having the space. And in humid Houston, anything in a garage or non-climate controlled storage will end up smelling like mildew anyway. Best wishes to you! Wow, this is eye-opening. I love how you have almost made it into a science, and are making good money at it. I wonder, does the income level of a neighborhood have a consistent effect on the finds you get and the profit you can make? Or is it more “random” in terms of what you can find where? Hey Miguel! You’re right, it does matter where you are and what the various neighborhood dynamics are like. But, there is a strong random element, too! Older neighborhoods with a lot of our elders will have more vintage / antique stuff and sometimes really awesome, old military stuff that sells great. But, sometimes their middle-age kids in newer neighborhoods start getting rid of old stuff they’ve kept over the years and are selling things as they downsize for retirement. You never really know, but generalizations are good for planning your trips to find stuff. As far as income level goes…Yes! You for sure won’t find Prada or Gucci stuff in a trailer park, but in places with expensive homes, you will find all kinds of random high-end stuff. I would go to estate and garage sales in these places first. But, treasures can be found anywhere! You’ve inspired me to start selling my old stuff on eBay again. I used to do this a lot instead of just donating everything, but lately I’ve felt it wasn’t worth the effort I put into it. Well, I’m in the process of doing some New Year’s decluttering and I have a few days off, so I just might try getting into the eBay game again. There is a certain thrill felt when someone buys my stuff, haha! Maybe I won’t turn a profit, but it’ll be nice to have a little extra money from stuff I would have given away for free. WOW! Those are crazy good ROIs good job! If I only I could get these returns in the stock market haha. Thank you for sharing and the inspiration, keep it up! I loved this article. I’ve dabbled in buying and selling items for profit and have just taken a more serious dive into utilizing this technique for some extra cash. It really works as long as you know your market and don’t overspend when purchasing!